I also found these printed sheers at Macy’s. I was thrilled with the price point on these because I have a lot of decorating to do throughout the house, and I didn’t want to spend a ton on curtains for windows that already have blinds. Still, I wanted to hang something to add another pattern to the room, so these were a great find. I bought the linen color, but they also come in charcoal and blue, and they’re available in a 95″ length for rooms with higher ceilings. These would look nice in a living or dining room too. A few of you advised me to get room darkening curtains for this room, but I really wanted something thin and filmy that keeps the room feeling light and airy, so hopefully the blinds will be enough to keep the morning rays out. I figure my guests are likely to be woken up by my coffee maker running at 5AM, anyway, ha! I’m a huge fan of throw pillows to add color and texture to a bed, so I ordered two of these diamond embroidered square pillows and an embroidered oblong tassel pillow. 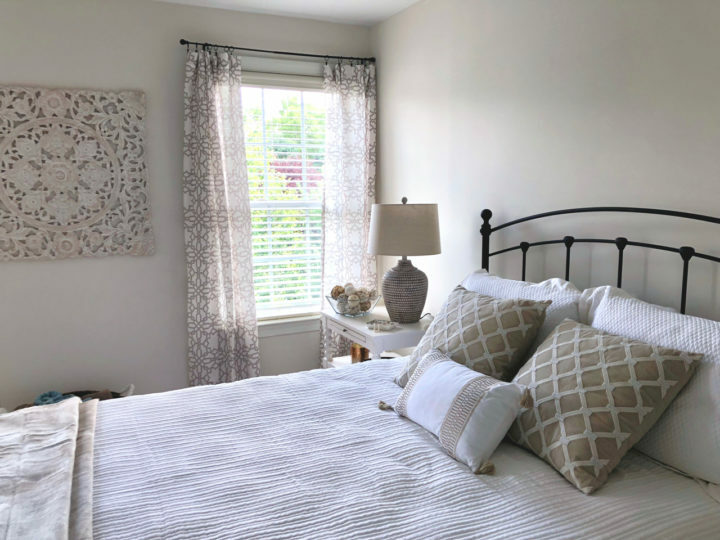 It’s hard to see, but the square pillows have pearl details which gives the room a touch of glam, and I love the tassels on the oblong pillow. I shopped my house and found a wall hanging that goes perfectly between the windows. I still want something for over the bed, though — a mirror perhaps? I’m working on that. We also changed out our shiny brass doorknobs and hinges to a more modern matte black that ties in with the bed and curtain rods. It’s the little things, ya know!?! The basket on the floor holds bath towels for my guests, but I’d like to get a stool or table of some sort to set that on, or maybe I’ll swap it out for a little cart that can hold folded towels. I actually just saw this one, and at that price, I may have to spring for it. Eventually I’ll get a dresser to add to the room, but the closet is empty so that will do for now. I’m sure this room will continue to be a work in progress, as is most of my house, but I’m really pleased with how it’s all coming together. I hope it proves to be a comfortable retreat when friends and family come to stay! 10.29.18 UPDATE: I found the perfect wall hanging for over the bed, and I’ve swapped out the bedskirt for one that works better with the beige tones in the room. Take a look! This post is brought to you by Macy’s and Shopstyle. Thank you for supporting the retailers that support this site. The room looks beautiful, JoLynne! I love those lamps and the square pillows. The curtains are amazing, and at less that $10each…wow! I wish I needed curtains right now! Thank you, and right!?! Those curtains are such a great price! The guest room turned out beautifully. I said it before and I’ll say it again, I’m impressed with how quickly you were able to decide on the furniture and bedding and how it all came together. Did you get the end tables at Macys? Thank you! Honestly, I spent hours, HOURS pouring over websites and trying to pull it together. I know what I like, but it’s hard for me to put it together. The designer who is helping me on other areas of the house stepped in after I finally gave up and sent her an SOS. She made it seem to easy. I wouldn’t have found those gorgeous lamps without her! The end tables area from Wayfair, but Macy’s has a lot of choices that I liked too. Just wondering what color and. brand paint is your wall. I really like the room and color of the wall. Yes, Bonbara is right — BM China White and White Dove on the trim. I’m really happy with how it turned out! It’s a very subtle difference. A whiter white on the trim would give more contrast, if you want that. The room looks great! Did you do it yourself? If you are going to put a dresser across from the bed, that would be the perfect place to hang a mirror, so I’d go for art or maybe a grouping of some flat baskets to add more texture to the room above the bed! I know I’d be comfortable in that room! Looks really nice. Oh, one more idea, I always love a chair in a room to toss the decorative pillows from the bed at night so they don’t go on the floor and for guests to sit in when they are in the room but not ready for bed…cozy place to read!!! I’m always amazed at what nice chairs can be had at places like Home Goods or TJMaxx for excellent prices! Good point about the dresser/mirror situation. I’ll have to think on that some more. I do like the idea of a chair in there, but I don’t think there’s room. It came out beautifully. It’s warm and inviting and I’m sure your guests will be very comfortable. Maybe in stead of a mirror over the bed you could hang a nice framed quote like “Start each day with a greatfull heart”. It’s what we have over our bed and it’s a nice reminder. I found it a Hobby Lobby. The room turned out beautifully! I love the neutral palette and that wall hanging is gorgeous! I hope your guests love this cozy retreat. The guest room is very pretty Jo-Lynne, and it’s suitable for men and women. I think a mirror would look great over the bed. Is this room on the main floor where the coffee aroma will cause guests to stir? That aroma is one that can’t be beat. I hope that your back behaves itself today, and that y’all do in fact have some sunny weather. Thanks, Ginger. The guest room is on the 2nd floor, but if the door is left open, it’s all open to the 1st floor and kitchen area. 🙂 I was joking about my coffee. For 12 years, guests have stayed in my living room — right off the kitchen — and I have felt AWFUL about my coffee machine buzzing before 6AM, but it is just my habit, and I cannot deviate from it. This new guest room upstairs will be such a nicer situation for my houseguests! That’s fun! I like the idea of Philly inspired wall art. Really enjoying all the decorating ideas/tips. The guest room is so pretty! I think artwork over the bed would be nice; maybe a wrapped canvas? I’m always afraid something heavy will fall down on me, and a mirror over the bed would freak me out! I definitely plan to check out the comforter. Love all the neutral colors, which will certainly allow emphasis on any seasonal tones you add later. Jan, I have that same fear! Must be a “Jan” thing. Love the soothing neutrals, Jo-Lynne! Lovely room! Too funny! That big resin piece between the windows hung over our bed in the old house for years. I never thought about it falling on us.😂 Good to know! I’d hate to scare away our guests. Jo-Lynne, I noticed that resin piece in your live chats and liked it. Do you remember where you got it? Your guestroom turned out beautiful! The color scheme is both soothing and inviting! I agree about a chair if you can find room for one. I have a chair in both our spare rooms and it’s a great addition. Thanks, Mary. I love that idea, just not sure I have room. So lovely and soothing. Your guests are going to feel really pampered. Add a bench for luggage? Our vacation home doesn’t have room for a bench at the end of the bed so I have luggage racks. And, I can store them away after company leaves. I was going to say the same thing! We also have a luggage rack, that way the suitcase doesn’t end up on the bed. Jo-Lynne, I love the room….very inviting and soothing. Oh, dear. I hope not! haha! This room looks so inviting. I’d love to redo my bedroom and I think a few of your ideas might sneak in. Your guest room is so pretty! I love how light and bright it is. We are trying to lighten up our living room and are in the process of changing out the shutters and adding a shade instead. I wanted some new decorative side panels to replace our darker ones, and yours look perfect! I just ordered them in the linen color. And wow, the price! Thanks for sharing! Hope your back feels better and the rain lets up! LOVE ❤️ your new guest room and all of the neutral choices you made! I think ANY guest would be more than comfortable in that room. Have really enjoyed following along with your move into your beautiful new home. Thanks for sharing that with us too! Beautiful room, Jo-Lynne! Was thinking maybe a place to lay open a suitcase, as well? Thanks for the heads up on the curtains, just ordered them in the grey for my bedroom. I’ve been wanting to update and what a great price! Yes, I thought about having a luggage rack somewhere. One word —- STUNNING! Job well done! I think a wreath over the bed would be nice, and bring a touch of nature in the room. You can change it out, with the season. Kirkland’s has a wide variety & sizes. JMO. Really pretty, Jo-Lynne! It has a bit of a beachy feel to me, which I love! One thing you might consider is a trunk. I have my dad’s old WW2 army trunk, which has been painted numerous times. It holds extra sheets and blankets for the guest bed, and can be used for a suitcase stand or a seat. Very pretty room! FYI, Macy’s has great towels. We have the Martha Stewart Collection, in white, which is called Meringue. They’re soft and fluffy, durable and a good price. Something else I thought of, I always appreciate a guest room that has a mirror somewhere in it. That might not matter if there is a bath attached to the guest room, but if there isn’t, a mirror in the bedroom is very helpful, because that’s where people will dress. Yes, I agree. If I don’t do one over the bed, I may hang one on the closet door, or put one on the wall at the end of the bed. There is a bathroom attached, but they will share that with one of my daughters so I think having a mirror in the guest room is ideal. My youngest child is moving out, soon, so I was thinking about turning her sea foam green and pink room with something neutral. It’s a large room, so my husband may use part of it as his office, but I can still go neutral with the walls and bed. Thanks for the inspiration. I especially love the idea of the neutral bed covering so I can work seasonal quilts and such into the room. I’ll be honest…I’m a little excited about redoing this room. She’s excited about moving away, but when she comes home to visit, at least she (and any guests who come to visit) will have a pretty place to rest. It’s fun to redecorate! All the best to your daughter! Thanks for sharing your guest room with us. I love the neutrality of it and your plans to change it up with the seasons. That is my plan for my guest room too. I hope you get lots of sunny hours before you head back home. Thanks, Bev. Today was GORGEOUS!!! Your guest bedroom looks soothing and welcoming. I love an uncluttered, neutral room. It allows my mind to rest. I have a mattellase cover on all my beds and like you, add a blanket and/or duvet, as required. My bedroom windows have similar blinds and light, billowing curtains. Company is here to visit, explore and get on with their day, not sleep their vacation away. Right? I love those lamps! They are perfect! Thank you for sharing your new home with us. You’re very sweet! Thank you! The bed is from Wayfair. I forgot to mention that a bench at the foot of the bed gives guests a place to open their suitcase, put their socks on in the morning and store those extra pillows at night. It also finishes off the bed nicely. I found one at Home Goods for a great price and another at a neighbourhood garage sale for $50. It’s wood and cane. I love it! I even have one at the foot of my bed. Yes, I do love the bench idea. I didn’t think I have room… but if I don’t do a dresser, I might. It turned out beautiful. You did a great job 🙂 your guests will love it!! Beautiful room! Great input from other readers too.😊. I would put a bench at the end of the bed. Towels would look great on a cart…could maybe include a basket of small toiletries and chocolates. I would put a favorite saying over the bed that is a long, narrow rectangle size. Or a ledge/shelf of some type with artwork and /or photos propped on it. I love the bench at the end of the bed idea! And the saying over the bed is a fun idea too. Your room turned out great. I love all that you have done. One question…you mentioned changing out the hardware on the door. How hard was it to change the hinges? I never thought of doing that but it really makes a difference. It is so easy. I can do it myself with a regular screwdriver but an electric screwdriver is easier. I changed out all the ones in my old house, and then when we got to this new house, they were all shiny brass again. Aggghhh… so we are setting out to change them all here too. It takes some time, but it is not difficult. And you can buy hinges in bulk on Amazon. I never thought I would say this, because I love my rooms to have color, but I absolutely LOVE the neutral palette in this room. We only have one kid left at home, so we’re getting ready to do a second guest room. Your room has great inspiration. Thanks for sharing your home with us! I just love reading your little ‘stories’. I really enjoy your perspective on fashion and decorating! Also your tips on the good sales are a plus. I never commented before, but I did want to let you know!! The room looks lovely and very inviting. I love neutrals and just redid my master for a similar serene feel and look. Our bed frames are even the same! I have 2 framed landscape pictures over the bed with soothing blues and neutral colors. You might want to try a bench under the architectural wall hanging so guests have a place to sit and you could also put your basket underneath the bench – that is what I do in my guest room. (I got mine at Ballard Designs) It won’t take up the space like large chair. Nice job! I LOVE this room! Definitely inviting, calming, cozy! I really like your nightstands…share where you picked them up? They are exactly what I am looking for my master bedroom ! It’s beautiful! Can I come? The room looks beautiful Jo-Lynne! Love all of it! I moved earlier this year and changed out most of my living room furniture and still working on hanging things up. This new place has a different style and color to it so still settling on what to do. It is fun to change some things out! Enjoy your new home! Wow!! You did a great job with all you had going on. I love a neutral palette. I just did my son’s room in neutrals, as he’s moved out for good now. But nothing on the walls yet. Love all you picked out. I just ordered those lamps from Macys. I’ve been looking at thousands of lamps online and then you featured these–perfection! Thanks, Jo-lynne! I’m late reading this but love, love it all. Great job. Love the neutrals. Accents add so much. Looks so beautiful Jo-Lynne! Very welcoming and soothing for your guests. Thanks for sharing the paint colors. Benjamin Moore is my favorite brand of paint. One thing I have that my guests seem to appreciate is a suitcase stand where they can put their suitcase on it like you do in the hotel rooms. You may have already thought of that but thought I’d mention it. Amazon has a lot of them and they aren’t very expensive but seem to be appreciated by our guests. I loved this post! I like the clothing, but this is a great new twist. I thoroughly enjoyed seeing what you did with your room and reading about how you put it all together. It looks wonderful. I’d love to read more decorating ideas. Thank you! Thanks, Kim! It’s fun to write about something different for a change, too. The guest rooms looks great. Love the headboard and foot board and the lamp is great. While waiting for a dresser you might consider putting a chair or two for guests to sit. I read the other day about getting a basket big enough to put the pillows in somthey have a place to go besides the floor. Loved that idea. Happy for your family and new home.